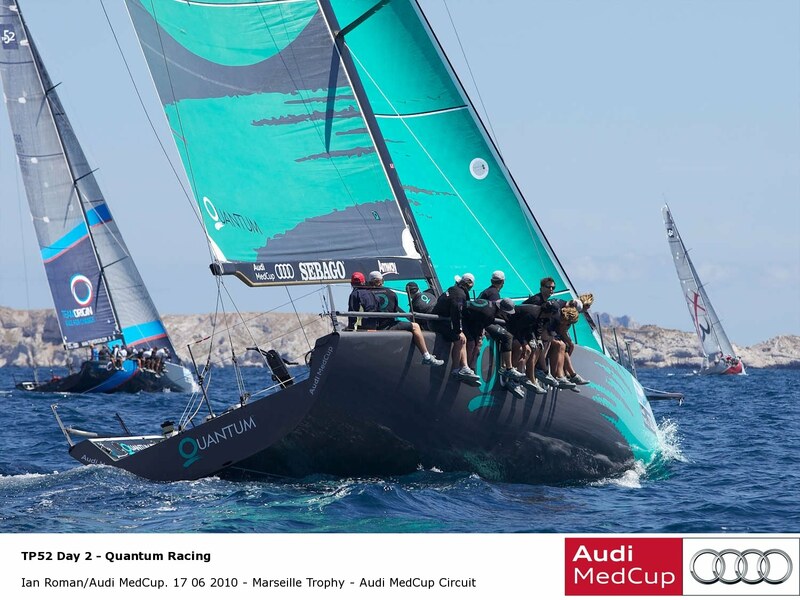 While many of their nearest rivals had an up and down day it was solid consistency which kept the green TP52 of the 2008 champions Quantum Racing at the top of the Audi MedCup Circuit’s Marseille Trophy regatta leaderboard today. In GP42 Series, the other green boat, Iberdrola, won both races. 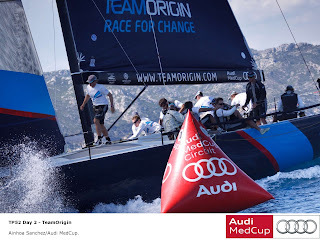 Out on the Rade Nord, a switch from yesterday’s southern arena, the breeze was equally hard to read and several teams results roller-coastered from one race to the next. Quantum Racing’s (USA) fifth and sixth keeps them ahead of Matador (ARG) only on tie-break as the Argentine TP52 had a taste of life at the both extremes. Alberto Roemmers’ (ARG) crew sailed a strong first race, getting into slightly stronger wind to the right early on in the first beat to lead from first turn, winning by a handsome margin in the 5-9 knots of gentle SW’ly breeze. But in the second race they found themselves at the wrong side of a big shift and slumped from third at the first turn to end up tenth over the finish line. Audi A1 powered by ALL4ONE (FRA/GER) made their key gain as they rose from eight to second by profiting from that one shift. The Franco German team were tenth in the first race. 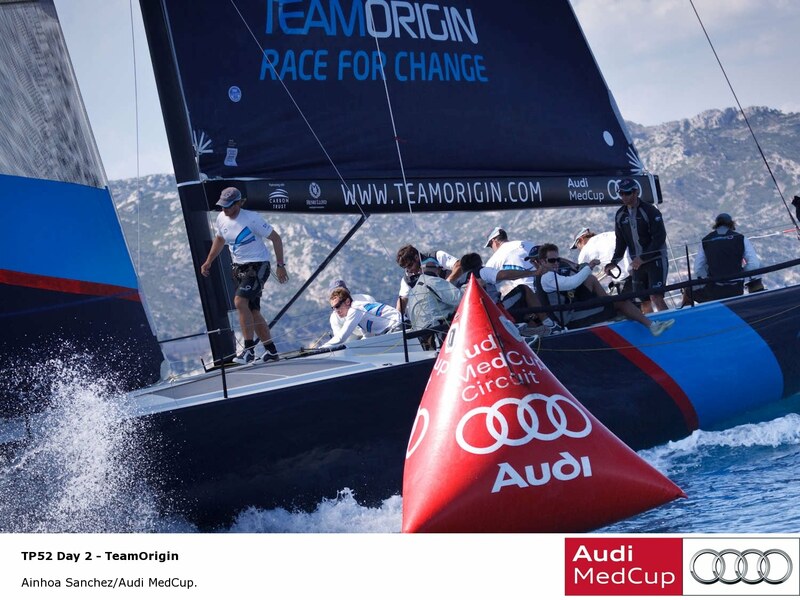 Top scorers of the day were Ben Ainslie (GBR), Iain Percy (GBR) and the TeamOrigin who scored a third in the day’s first then convincingly won the second race to elevate themselves to third on the regatta standings. Percy and strategist Santi Lange (ARG) showed an almost uncanny ability to read the pressure best, preserving their gains when they could, also proving that they seem to have put their Cascais speed issues behind them. The leader board after five races is incredibly close. Only five points separate the top five boats. 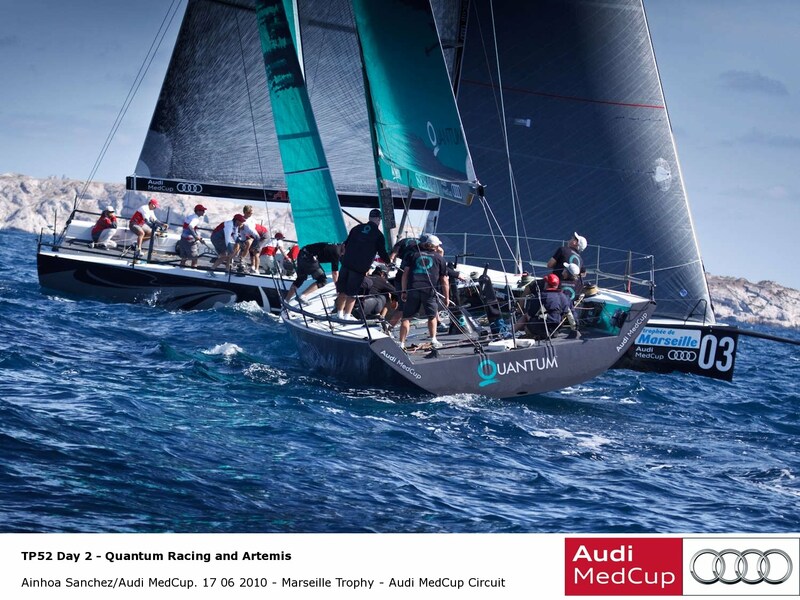 Quantum Racing are credited with the lead by virtue of their two victories yesterday, and TeamOrigin are only one point behind. 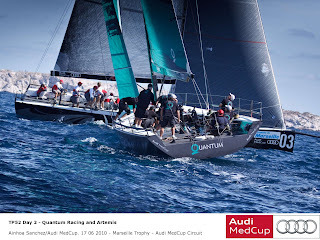 But the coastal race’s 1.5 points bounty on tomorrow could prove decisive in this regatta and Quantum Racing go into it perhaps with an edge of confidence after winning the longer race here last year. The Green Fear is back The GP42 Series has in the past lived in fear of the bright green Iberdrola (ESP), sailed by the Desafio America’s Cup team to devastating effect to dominate the class during its 2008 season. 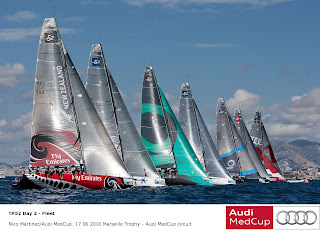 Most of that fear had dissipated over the last year as the newer boats had risen to the top, the Green Machine came out to play only a few times during the 2009 season, and they turned in an uninspiring performance last month at the Portugal Trophy in Cascais. But the fear is back. 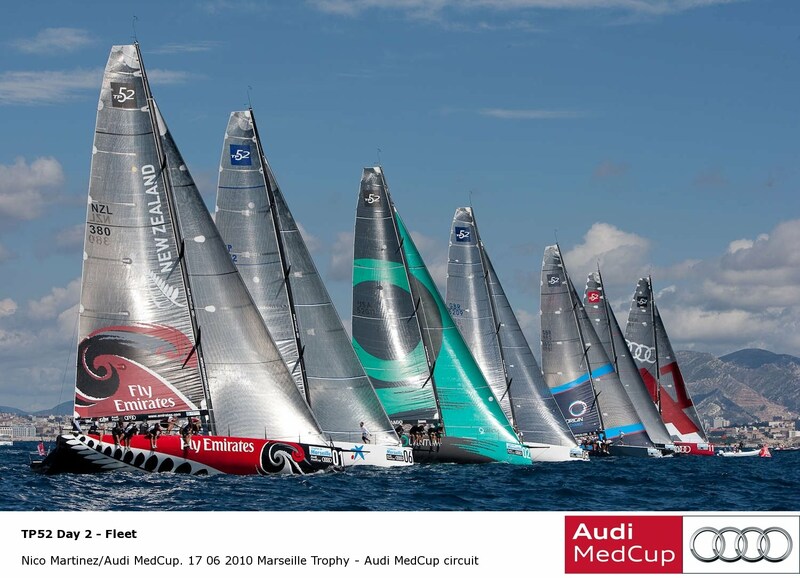 The light 6-9 knot and conditions of today suited the narrower 2007 and 2008 Botin & Carkeek designs compared to those of last year, and Iberdrola is the fastest and best-sailed of them all, putting two convincing wins on the scoreboard today to take a 4-point lead in the GP42 Series over current runner-up Peninsula Petroleum (GBR). This is only the second appearance of this Gibraltar-based team in the Audi MedCup, and already they are showing much-improved performance over their results from Cascais. AIRISESSENTIAL (ITA) also showed great promise today, recovering from a bag caught on their rudder in the first race to grab and maintain a second place in the second race. This 2008 Felci design has also proven fast in light air, and is under the helm of owner Roberto Monti (ITA). This regatta may very well come down to weather: if the light conditions persist, Iberdrola will be the boat to beat. But if the breeze comes up, watch out: the Madrid Caser Seguros (ESP) and Islas Canarias Puerto Calero (ESP) teams will come roaring back.